– at the western end, to conceal the road within state-significant Royal Park. McGauran says that in terms of design, emphasising the existing precincts, and minimising impacts on Royal Park would be better than enhancing the experiences of road users by designing elevated, obtrusive ‘gateways’. McGauran contends that Alexandra Avenue should be constrained as part of the project to prevent traffic build up after the project, and to lock in benefits to Alexandra Avenue. He says that a private developer would not get away with not upgrading Alexandra Pde as part of the project. 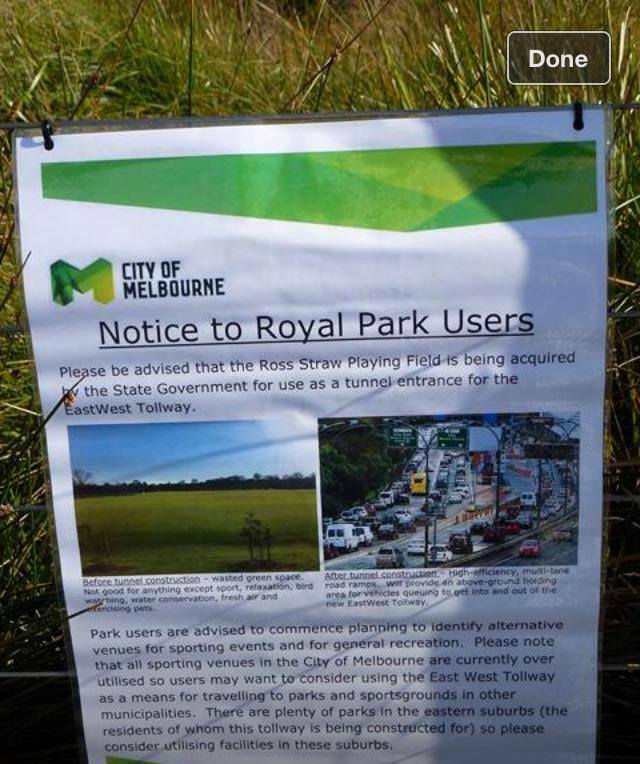 LMA claims that Ross Straw Field is effectively cut off from the rest of Royal Park, and that the Commonwealth Games Village will still have access to the wetlands. McGauran equates this to saying people can play in the car park, as elevated roads will diminish the experience of that part of the park. The Commonwealth Games Village was designed and promoted as providing easy access to Royal Park, this would be diminished by the East West Link. 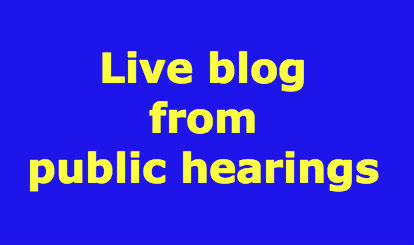 Wren asks whether there should be noise walls for Royal Park, noting that there is nothing about this in the CIS. McGauran says there should be. The next witness is Rob Moore speaking on urban design. Moore agrees with McGauran, the Urban Design Framework is inadequate – too vague, too weak, inadequate, unenforceable. Moore agrees that traffic engineering is an important component of the Urban Design Framework, but that other professions need to be involved. Moore also agrees with McGauran that Alexandra Ave should be reduced to lock in the benefits, and to create a tree-lined boulevard. Moore says that there is a need in Royal Park to knit together the two parts of the park which are currently separated by MacArthur Rd. This could be done by taking advantage of any traffic reductions. He says there should be no net loss of public open space within the City of Melbourne as a result of the project. Moore also raises concerns that the CIS is silent on third party commercial signage on the road (advertising) and argues this must be prohibited. McGauran presented statements on urban design as commissioned by Moonee Valley City Council and Yarra Council. McGauran’s proposition is that the project does not meet the objectives as specified in the UDF, nor the Victorian Urban Design Charter. The UDF for Royal Park states any new road structures are to emphasise the dominance of the parkland and minimise severance. With respect to Hoddle St, the changes will a create visual barrier between Clifton Hill and Collingwood: it will negate opportunities to redevelop and renew Victoria Park. Collingwood, Fitzroy Clifton Hill are special areas of Melbourne and interference should be minimal. The view was put that a shorter tunnel has been chosen for this project at the cost of Royal Park. Elliott Avenue interchange has been included to provide access to the zoo, hospitals and Unis, whereas a longer tunnel would be warranted to preserve Royal Park. The road should be invisible in Royal Park. Some further points made: elevated roads in urban environments are not innovative, nor world’s best practice; Debneys’ Park and Moonee Ponds Creek have been badly treated; Debneys’ Park will be reduced in size by one hectare; we should be creating higher quality facilities and open spaces not just reinstating some of what is lost. Reworking the UDFramework by a team comprising road designers and council representatives within a short period of time would be advisable according to McGauran, but the committee doesn’t have the 3-4 weeks that would be required. There have been 122 documents tabled in the course of eight days of hearings. If you have time to spare, you can read them here. More documents were tabled this morning, some focusing on the performance requirements – which are significant to Councils as they argue for stronger measures to reduce the impacts of the East West Link. The committee is maintaining an updated coy of performance requirements including all submitters’ suggestions. There are also a few timetable changes: Moonee Valley will start Thursday and Yarra next Monday. 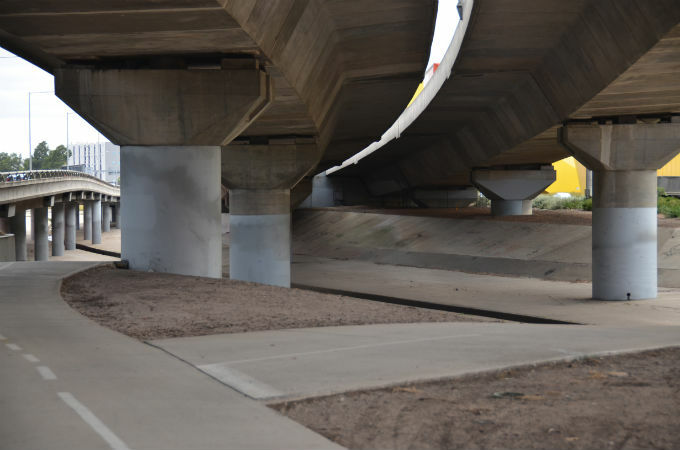 Questions have been asked about the length of possible cut and cover construction of the tunnel trough Royal Park – but definitive answers are not yet available. The time required for construction has also been queried. Graham Porteous presented his evidence on impacts on recreational activities in the City of Melbourne areas. He mentioned disagreement in the relevant ‘conclave’ (pre-hearing discussion groups) about the impact of the project on recreation. Porteous pointed to the importance of quality open space for social, health and community benefits. The population of the City of Melbourne is expected to double in the next 17 years to 192,041. 90 sports clubs using 40 sports grounds which are currently at 90-95% capacity. Exponential growth has been significant and it is already a challenge to meet needs. Ross Straw Field is home to nine sporting clubs. An MOU worth $15m has been drawn up between LMA and COM to manage the impact on sports clubs. What can you play under a viaduct? Bocce, rock climbing, tennis? It depends on the height of the viaduct and where the pylons are. The LMA put to Porteous the possibility of City of Melbourne residents using the 26 sports fields of Albert Park, or replacement open space. An argument was put that upgrading grass to synthetic turf allows for increased capacity – apparently it’s in the plan – but this would detract from the passive recreation of the area, says Porteous. You can’t have sports fields after EWL, but the LMA argues you could have skate parks and other activities instead.